Glen Perkins has really done his job this year for the Minnesota Twins. In his 23 save opportunities, he has gotten the job done 21 times. When the RHP has been called in to the game, he has kept hitters guessing to the tune of a 1.82 ERA. To go along with that, Perkins has kept the hitters to a .172 batting average against him. At the All-Star break, the former Twin Starter has a great strikeout:walk ratio as he has 47 K’s and has only walked 7 hitters. With those numbers, Perkins averages more than a strikeout per inning as he has only pitched 34.2 innings up to this point. This season for the Kansas City Royals, Greg Holland has shut the door on opponents 22 times in his 24 opportunities. At the All-Star break, the RHP has kept a very low ERA as it sits at 1.80 – and has controlled hitters to a clip of a .171 opponent batting average. Holland has been very reliable this season as he averages about a strikeout and a half per inning as he has 60 K’s in 35 innings. The only downside to Holland is he has walked a total of 11 batters in those 35 innings. However, with everything taken into consideration, I think the Royals Closer is the 4th best closer in the AL at the All-Star break. 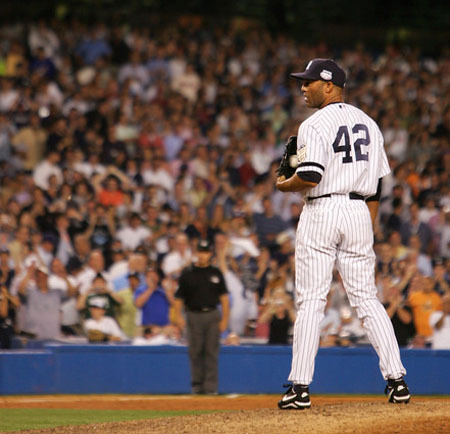 This may come as a surprise to some but I believe that Mariano Rivera is only the 3rd best Closer in the AL this year. Rivera has pitched very well in what will be his final MLB season – and he is arguably one of the best closers of all time. Mariano Rivera has been outstanding for the New York Yankees so far this season and is among the top three closers in the AL right now. At the All-Star break, Rivera has closed the door on his opponent 30 times in his 32 chances. In those games, he has an ERA of 1.83 – and has kept hitters guessing as opponents are hitting .265 against him. So far, Rivera has 32 K’s and 7 walks in his 34.1 innings. Now these numbers may not seem all the great if you directly compare them to others, but I would take Rivera over most closers any day of the week because when you need to finish the game, you can almost always count on him. Grant Balfour has been one of the best pitchers in the AL this year at his position. Balfour has been a perfect 25 for 25 in his save opportunities for Oakland this season. When the A’s have needed someone to finish off the game, Balfour has been that guy. 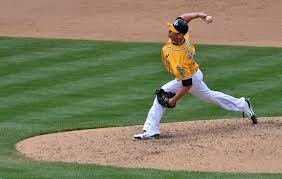 Grant Balfour has been amazing for the Oakland Athletics this season. At the All-Star Break, Balfour has been a perfect 25 for 25 in save opportunities – and dating 42 straight shut downs going back to last year. Right now, Balfour is the only closer in the MLB to be perfect in save opportunities and have at least 20 saves. In his 38.2 innings, he has an ERA of 1.63 which is second among all closers. In those innings, Balfour has 41 K’s and 13 BB’s. The ALL – Star has spent this season keeping hitter baffled so that they are only hitting .193 against him. So if I needed someone to finish a game for me, Grant Balfour would definitely be a good option. 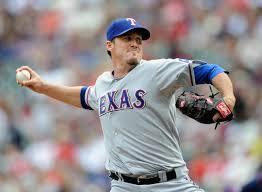 In my opinion, The Texas Rangers have the best closer in the American League this season in Joe Nathan. This season, (the long time former Twin) has dominated opponents by shutting the door in 30 of his 31 save opportunities. In those games, Nathan has an ERA of 1.36 which is the best in the AL. To go with that, he has yielded an opponent batting average of only .149 which also leads the AL. At the break, Nathan has 42 K’s and has only walked 10 batters in his 39.2 innings. That puts him at over a strikeout per inning. Looking at everyone stats and watching them play, its pretty clear that Joe Nathan is the best closer in the AL at the All-Star break. So far this season, Rafael Soriano has pitched pretty well for his Nationals team. He’s converted 25 saves in his 29 opportunities. With how Soriano hasn’t pitched well enough to be an All-Star this year, but he has pitched well enough to be one of the top five players in his league at his position. 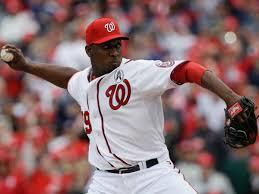 Washington Nationals closer Rafael Soriano has pitched fairly well for his team so far this season.He has been able to finish off the game 25 times in his 29 opportunities – and has posted a 2.25 ERA while doing that. At the All-Star break, the Veteran RHP has struck out 29, while walking 8 batters in his 40 innings of work. Soriano isn’t an All-Star pitcher, but he is one of the 5 best closers in the National League so far this season. Aroldis Chapman is the closer for the Cincinnati Reds and he does his job quite well. 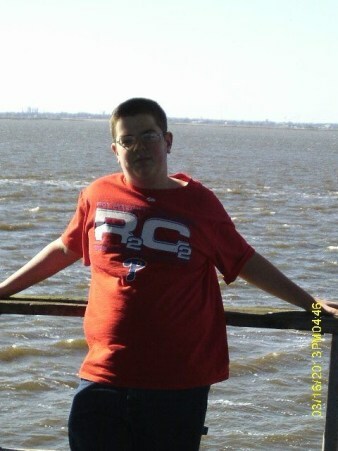 He is the perfect guy to be a closer because of his fastball that can top 105 mph. 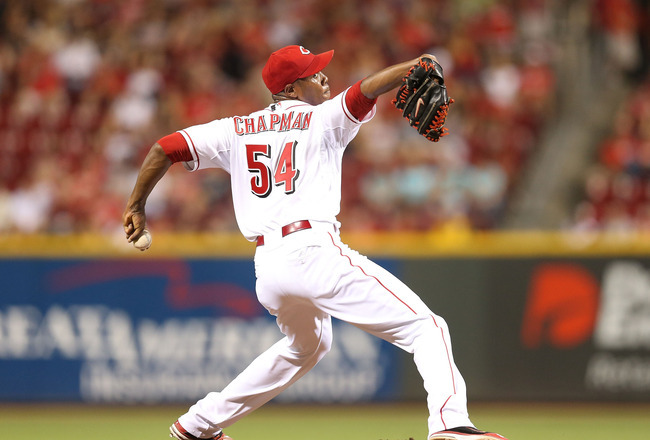 The only problem Chapman has had so far this year is the fact that he has blown 3 saves. Aroldis Chapman really helps the Reds from the Closer position. The “Cuban Missile’ has done his job in 21 of the 24 times he has been called on – and has maintained an ERA of 2.79 so far this year. Chapman has a great fastball that can top 105 mph, which has helped him strike-out a whopping 64 people this year in only 38.2 innings. That’s nearly 2 per inning. The NL ALL – Star does have some problems with control, however because he does have 19 walks on the year. Edward Mujica has been solid for the Cardinals this year. His ERA is a little high for a closer but he keeps hitters off-guard and does not walk people. 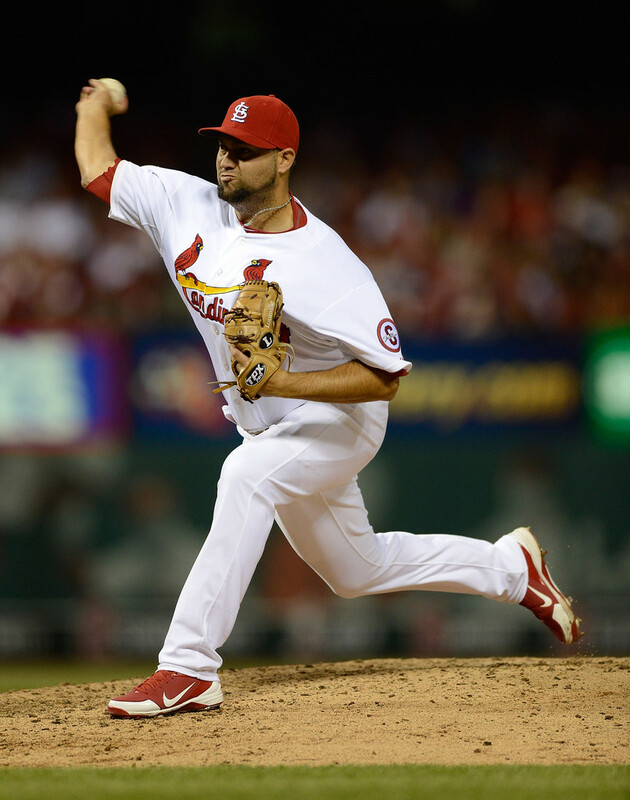 Edward Mujica is the close for the St. Louis Cardinals and he does his job very well. Mujica has saved 26 games in his 28 opportunities. One of the great things about him, is his control – as he has only walked two hitters this year. Mujica has struck out 34 batters in 41 innings, which is pretty good because he pitches to contact. The Cards new Closer has yielded only a Batting Average of .188. The only downside to Mujica is his ERA is a little high for a closer as it sits at 2.20. Craig Kimbrel has been really good for his Atlanta Braves this year. He has a great Era that sits just above 1.5 at 1.53 which leads the NL. Kimbrel has had a little trouble finishing some games as he has blown 3 saves in his 29 opportunities which still isn’t that bad. 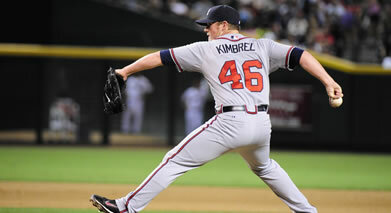 Kimbrel dominates hitters as he averages over a strikeout per inning and opponents are only hitting .185 against him. 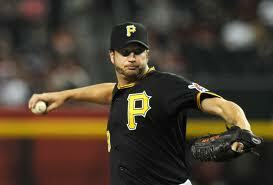 Jason Grilli is the Pirates closer and in my opinion is the best closer in the entire National League. The journeyman Relief Pitcher dominates hitters and doesn’t make many mistakes. If you needed someone to finish a ballgame, Grilli might be your best choice in the NL right now – as he has only blown one save in his 30 opportunities. Jason Grilli has been the best closer in the National League this year at the All-Star break. He has dominated hitters with an ERA under two. Grilli averages over a strike-out per inning as he has struck out 63 hitters in his 40.2 innings. He also has pretty good control as he has only walked 9 batters at this point in the year. This season. we have great closers up and down both the American and National Leagues. From pitchers such as Jonathan Papelbon (who isn’t on this list), to Jason Grilli – (who may be the best closer in the Majors currently), there are many guys who can get the job done at the end of the game. So think back to the scenario I gave you at the beginning. If you’re managing your favorite team and you’re in that situation who do you want closing out that game? I’d love to hear your opinions on who you think is the best closer in the league so please leave your thoughts below in the comments. Closers are definitely one of the most important players on your rosters. They come in when you need someone to finish off the game. In the tense situations you need someone with confidence, someone with a special personality, someone who can get the job done. Dan is a huge fan of Chase Utley and Cliff Lee. He has been a baseball fan his whole life and loves writing about baseball. Posted on July 16, 2013, in The Rest: Everything Baseball and tagged @danwanser on twitter, all-star, American league, aroldis chapman, Atlanta Braves, cincinnati reds, craig kimbrel, dan wanser, Edward Mujica, glen perkins, grant balfour, greg holland, holland, jason grilli, joe nathan, jonathan papelbon, kansas city royals, Major League Baseball All-Star Game, mariano rivera, minnesota twins, mlb, national league, new york mets, new york yankees, oakland athletics, pittsburgh pirates, rafael soriano, st louis cardinals, texas rangers, top 5 closers al, top closer AL, washington nationals. Bookmark the permalink. Leave a comment.